CARACAS, Venezuela (AP) — Working class neighborhoods in Venezuela’s capital erupted in violence late Tuesday for a second straight night amid fears that demonstrations called by the opposition could spur further violence. 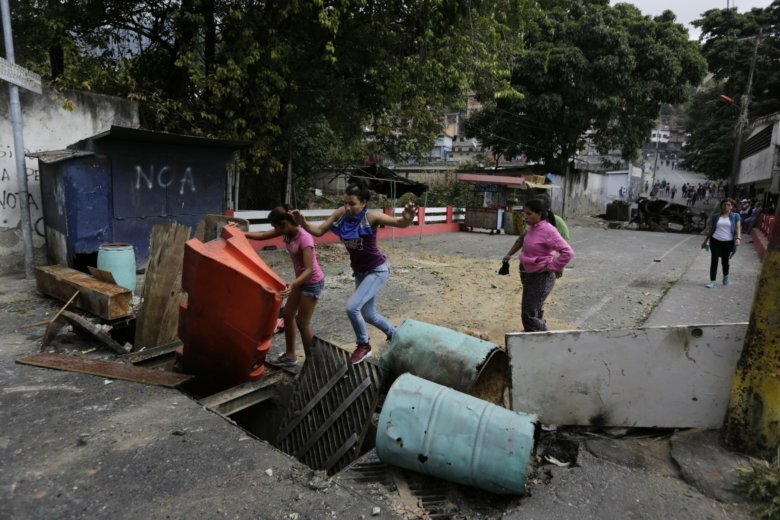 In the Catia district, a few miles from the presidential palace, youths set fire to barricades while shouting for President Nicolas Maduro’s government to fall. Videos circulating on social media showed residents in the southern city of San Felix setting fire to a statue of the late President Hugo Chavez, who installed Venezuela’s socialist system and picked Maduro to succeed him. On Monday night, Venezuelans barricaded streets in dozens of Caracas areas that haven’t seen such turmoil in years. The government has accused the opposition of trying to provoke bloodshed. In the western city of Maracaibo, authorities said late Tuesday that security forces seized grenades, a submachine gun and National Guard uniforms from a three-person “terrorist” cell that officials said was planning to infiltrate Wednesday’s march. “Here we are all in the same holding pen: without light, without water, without medicine, without gas and with an uncertain future,” Juan Guaido, president of the opposition-controlled National Assembly, wrote on Twitter, calling for nationwide demonstrations and urging Venezuelans to abandon Maduro. Guaido, a member of the Popular Will party, is also pursuing a campaign to gain the support of the armed forces, which Maduro’s government relies on to suppress unrest. Dozens of leaders in the international community have joined the chorus calling Maduro’s presidency illegitimate. The same night, another group of heavily armed national guardsmen published a series of videos on social media saying they won’t recognize Maduro’s government, citing Guaido’s call to action. “We warn that the nexus has been clearly linked between terrorists in the Popular Will party and those who perpetrated isolated violence yesterday,” Rodriguez said. People clustered on sidewalks trying to come to terms with the damage and thinking about what might happen during Wednesday’s protests. The smell of tear gas lingered in the air. The clash in that neighborhood left a burned ruin of the Robert Serra cultural center, which is named for an important Venezuelan socialist leader who is considered a martyr. It’s unclear who burned the building, but officials say criminals threw gasoline bombs into the center. Rallying supporters before Wednesday’s expected protests, he also accused Pence of trying to overthrow his government by fomenting unrest and said that as a result he would be reviewing the future of U.S.-Venezuela relations. “Do you want to be a country colonized by the gringos?” he asked the crowd of several hundred seated before him.